Spray deep 10-inch skillet with nonstick cooking spray. Spread 1 cup of the salsa over bottom of sprayed skillet. Break each taco shell into 4 to 6 pieces. Arrange half of the broken shells over salsa. Spread 1 cup of the remaining salsa over shells. Sprinkle with 1/2 cup each of the Monterey Jack cheese and Cheddar cheese. Top with onion, corn and green chiles. In small bowl, combine beans, cumin and steak sauce; mix well. Spoon evenly over mixture in skillet. Top with remaining broken shells, Monterey Jack cheese and Cheddar cheese and salsa. Cover; cook over medium-low heat for 15 to 20 minutes or until mixture is bubbly and cheese is melted. 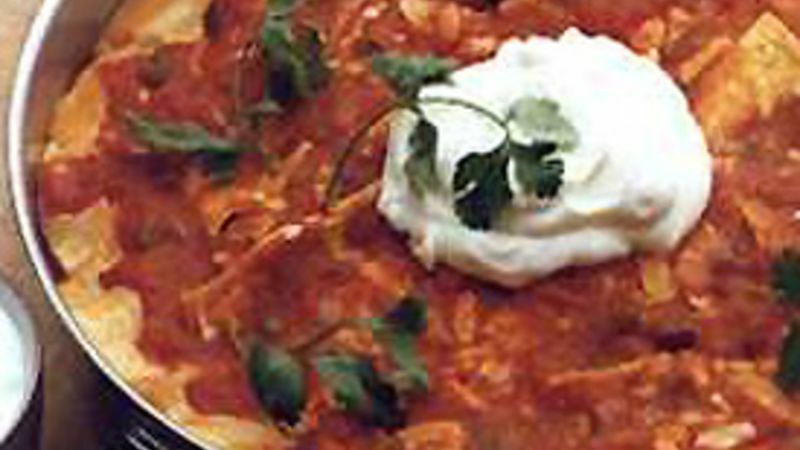 To serve, top with 1/2 cup of the sour cream; garnish with cilantro, tomatoes, olives, jalapeno chiles and guacamole. If desired, serve with remaining 1/2 cup sour cream.